Inner Mountain has been created from simple beginnings, after experiencing a connection with the environment that comes with going into the mountains. Our initiative is to share this connection through facilitating amazing experiences and new sensations, while providing quality service to our customers. With a itinerary created from our most experienced staff and with the invaluable help of our privates professional guides, we take care of giving a service that gather intimately our customers with wildlife, cultural influences and local events. Offering an experience where you really can "live the destination”. All the experiences you live will create the person you are today. When you allow these experiences to enrich your life and motivate you to continue exploring, you are becoming connected to your INNER self. Owner and Co-founder of Inner Mountain. An innate loving Mountains, explorer and climber motivated by new experiences in nature. His passion is to travel and see as many places as possible. With a lifetime dedicated to outdoors sports, Patricio has an extensive experience guiding in different parts of the world. 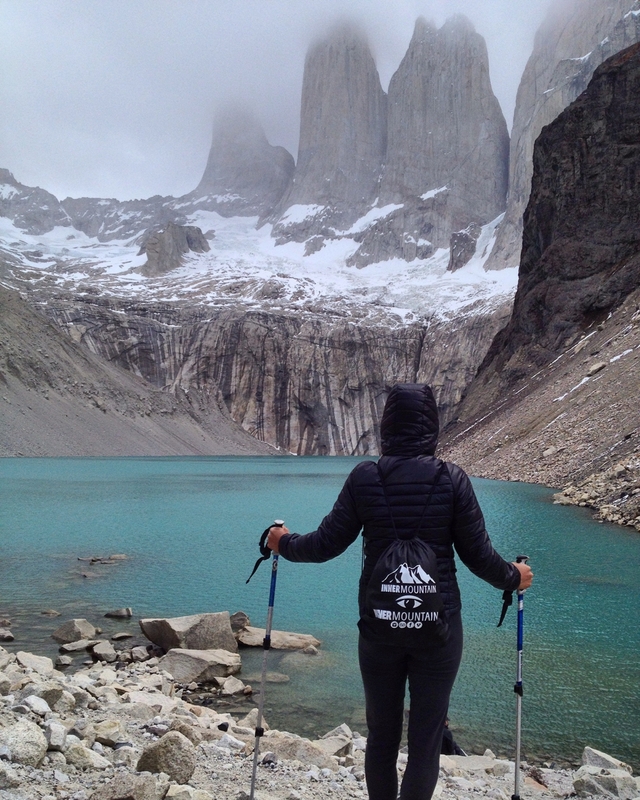 Leading major expeditions around Patagonia; El Chalten, Torres del Paine, Perito Moreno and Ushuaia. Also highlighting his work as a guide for ice climbing and glacier expeditions in the Southern Patagonia Ice Field. As a professional logistics operations, Patricio has been participating in large internationally renowned companies such as Epic Private Journeys and The Southern Terrain in the United States. Titled in Commercial Engineering, lover of nature and a passion for mountain and sport lives looking for new places to snowboarding and climbing. Karina has been focused on tourism and environmental protection for several years what has led her to have great knowledge of flora and fauna, especially birds. Guide works almost throughout Chile. San Pedro de Atacama, central zone, region of Araucania and Torres del Paine in Patagonia have been places where it was developed as a guide to leading her well to have a vast experience in tourism. It has international certification rescue in remote areas WFR (wilderness first respond). Certified mountain courses, kayaking, rafting, white water rescue, sailing, diving and first aid. Domingo was Instructed based leadership and security in all areas. A lover of sports and nature. With vast experience in the outdoors life and high mountain, Domingo has specialized for several years to climb big mountains taking it to win several significant peaks in our country; Volcan Ojos del Salado (6893 meters, the highest volcano in the world), San Jose Volcano Summit North (5750 m), Cerro Plomo (5,450 m), Maipo Volcano (4,900 m), Cerro El Morado (4,600 m), Lonquimay volcano (2,865 m) among others. From an early age that Ignacio dedicate his time to outdoors sports, snowboard, bicycle, skimboard, mountaineering and rock climbing are his passions that always led him to be in constant relationship with nature, creating a love for her and the great outdoors. Professional in Ecotourism, Ignacio today participates in special interest tourism expeditions and scientific expeditions, taking it to make major crossings such as the "Water Route", traverse which start in the Central Andes Range crossing all to the Pacific Ocean in an expedition of 27 days seeking to generate awareness regarding the ecological importance of the Maipo basin and its water to the central area of our country. Graduate from the Patagonia Guides School in Aysen region. He has extensive experience leading in Patagonia and in the central zone of Chile. Certifications in rescue (vertical rescue and rescuer in wild waters) and rafting guide certificate class 3, course held in Futaleufu. For hobby and his passion for the mountains, Tomas has large asenciones in Bolivia, Argentina and Chile. He Lived more than two years in the United States may become professional in different areas of nature; rivers, mountains and glaciers. Nature and travel lover, Cristobal has finished his studies in Ecotourism, profession in which he has travelled to several parts of Chile and America. In constant search of new experiences and adventures he has connected with nature conservation and cultural exchange in order to expand his knowledge regarding sustainable development. Passionate about this life style, he has worked for several years as ecotour guide into the Andes, in the north, central and south patagonia in Chile. Educated in the NOLS principles, he has conscience about the respect that must be shown to our environment during outdoor activities and in the day to day activities, also, has participated in several first aid and mountain instructions as well as group management and leading. Italian­Chilean intrepid mother of two beautiful kids, amateur Yoga. He works today as intercultural mediator and guide in urban areas; Santiago, Metropolitan Region and Valparaiso in 5 languages functioning as a bridge between cultures. Has extensive experience make inquiry and recommending unusual corners city in search of combining his work and his passion for coffe shop´s, craft beers, local wines with food Vegan and Naturist, accompanied with the best environment Landscape and Service. Rodrigo takes years specializing as ecotourism and mountain guide, so he acquired extensive knowledge in outdoor activities, obtained through their experiences in different parts of Chile and long trips he have made for South America. His training has taken him down a path focused on communicating his values and experiences, in pursuit of environmental conservation and responsible use it. Definitely a Patagonia, Amazon jungle and mountain lover. Here at Inner Mountain we are not just a company, not just groups of guides and tourists, we go beyond tourism. We are lovers of exploration, nature, and human cultures. We are designers of experiences, being aware of our roles as professionals. Our mission is to offer a quality service to our clients, minding their safety and well-being, always proudly remembering the smile of every person that has explored and experienced with us the majesty of nature. Our clients are people that seek to live new experiences, see new sites, and share new moments. They are those who go beyond tourism to draw on local experiences, and with every place they visit finding opportunity to grow, enjoy, and learn. Come and have fun with us!.